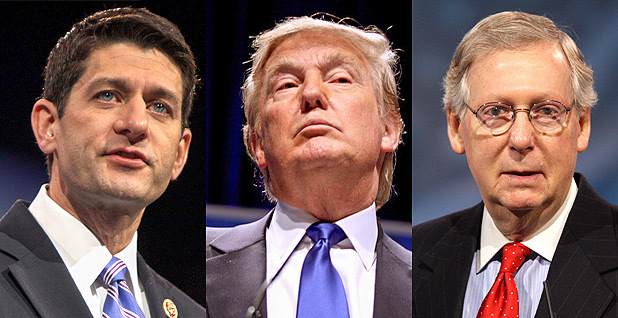 House Speaker Paul Ryan, President Donald Trump and Senate Majority Leader Mitch McConnell are presiding over what could be an overhaul in federal regulations and rulemaking. Photos by Gage Skidmore, courtesy of Flickr. Some advocates would have seen him do more, but most agree his environmental record is strong, from the Clean Power Plan and the Paris Agreement to enhanced fuel efficiency standards for vehicles and habitat restoration efforts. "The Obama administration left an incredible legacy on both climate and energy, especially in the second term," said David Goldston, director of government affairs at the Natural Resource Defense Council. "Really very comprehensively addressing both the climate problem and the need for clean energy." Republicans and their allies, on the other hand, have spent the same eight years disgruntled and frustrated. They see a number of Obama's actions as executive overreaches that have stymied the economy and derailed job growth. William Yeatman, senior fellow with the conservative Competitive Enterprise Institute, said the Obama administration favored the "single-minded" agenda of environmental activists, demonizing commodities like coal. "The EPA was captured by environmental special interests whose narrow agenda comports poorly with environmental policymaking as set forth by all these statues," he said, referencing the Clean Air Act, Clean Water Act and Endangered Species Act. "I assume the incoming administration will be more open, more cooperative, to take more voices into account," he said. With Obama leaving office today, congressional Republicans are dusting off environmental and regulatory reforms more likely to fly under President-elect Donald Trump. The list includes proactive measures that would change the way rules are promulgated, reactive regulatory rollbacks, changes to judicial review, and modifications to bedrock environmental laws like the Endangered Species Act and Clean Air Act. The "Regulations from the Executive in Need of Scrutiny Act," H.R. 26, known as the "REINS Act," would require congressional approval of measures with an estimated annual economic impact of more than $100 million. The legislation has passed the House a number of times but has stalled in the Senate. Proponents argue it would increase accountability for major executive branch policy decisions. But skeptics see the bill as a potentially unconstitutional poison pill that would result in paralysis of all regulatory activity (E&E Daily, Jan. 4). House Republicans passed the bill again this month. The "Regulatory Accountability Act," H.R. 5, would require federal agencies to identify the objective of a proposed rule and choose the lowest-cost alternative. It would repeal the Chevron and Auer legal doctrines, which encourage the courts to defer to agencies' interpretations of laws. It would also prevent billion-dollar rules from taking effect until courts can resolve litigation brought against those agency actions, among other reforms. Among other ramifications, that could affect U.S. EPA's ability to set air quality standards under the Clean Air Act. The bill passed the House this month (E&E Daily, Jan. 12). The "SEC Regulatory Accountability Act," H.R. 78, would amend the Securities Exchange Act of 1934 to increase the use of cost-benefit analyses in the rulemaking process, primarily in the financial sector. The measure would require the SEC to take a number of additional steps before issuing new regulations. The agency would be required to assess whether there are cheaper alternatives that are still legal and conduct a cost-benefit analysis. The agency would be required to ensure that any regulation is written in accessible language. Critics worry it opens the door for other agencies (E&E Daily, Jan. 11). The measure passed the House this month. The "Sunshine for Regulatory Decrees and Settlements Act," S. 119, the "sue-and-settle" bill, would prevent environmental and other groups from compelling federal agency action through litigation. The measure requires that consent decrees and settlements be filed only after interested parties have had a chance to comment. The bill stipulates that 60 days be left between proposal and filing. Courts would then be required to incorporate the public comments into their decisionmaking. The bill also makes it easier for a new administration to petition a court to modify consent decrees approved during past administrations. Senate Judiciary Chairman Chuck Grassley (R-Iowa) and Rep. Doug Collins (R-Ga.) introduced the measure. The duo unsuccessfully introduced the bill in the 113th, 114th and 115th sessions of Congress. Former Rep. Ben Quayle (R-Ariz.) also introduced the measure in the 112th Congress (Greenwire, Jan. 13). The "Secret Science Reform Act," the latest version of which is still forthcoming, would fundamentally alter how science is used in crafting environmental policy. It would require that EPA use only "transparent or reproducible" science to develop regulations and that such scientific data be posted online so that they can be scrutinized. Proponents argue that the legislation simply makes science transparent. Democrats and scores of scientific organizations say the measure would have a crippling effect. Rep. Lamar Smith (R-Texas) said the bill would be one of his top priorities this year (Climatewire, Jan. 9). The "Separation of Powers Restoration Act," H.R. 76, sponsored by Rep. John Ratcliffe (R-Texas), would limit federal agencies' ability to interpret legislation and promulgate regulations. Ratcliffe said the measure is intended to restore three "co-equal" branches of government. The bill passed in the House last year, and Ratcliffe said he is optimistic it will again in this new session of Congress. The "All Economic Regulations are Transparent Act," H.R. 75, would prevent the administration from implementing new rules without first alerting the public and providing at least six months for comment. The bill passed the House last year, 244-173. The "Small Business Regulatory Flexibility Improvements Act," H.R. 33, would amend the Regulatory Flexibility Act and require agencies to tally direct, indirect and cumulative impacts of new rules on small businesses (E&E Daily, Jan. 17). The "Searching for and Cutting Regulations that are Unnecessarily Burdensome Act," known as the "SCRUB Act," which passed the House last year, would establish a nine-member body and authorize an appropriation of up to $30 million to independently assess which regulations are outdated or unnecessarily burdensome (E&E Daily, Jan. 8, 2016). The Clean Power Plan: Repealing the Clean Power Plan has long been a top priority for congressional Republicans. The Supreme Court in February 2016 halted implementation of the Clean Power Plan until judges determine whether it is legal. Many states canceled their planning efforts, although 14 asked EPA to provide guidance on carbon trading and other elements of the regulation. Certain programs related to the plan could be axed with an executive action, but the Clean Power Plan itself would have to be repealed through tradition, lengthy repeal or court challenge. House Republicans tried to torpedo the regulation in last year's budget proposal. The Paris Agreement: The Paris climate agreement is a global response to the risks of climate change. It was signed by nearly 200 countries and went into effect last November. Trump has said he has an "open mind" about the agreement, but many conservatives would have him pull out. Former Exxon Mobil Corp. CEO Rex Tillerson, Trump's pick to lead the State Department, said the administration should "maintain a seat at the table" for international climate negotiations so it can keep tabs on whether other big polluters are committed to cutting their greenhouse gas emissions and "adjust our own course accordingly," he said during his confirmation hearing (E&E Daily, Jan. 12). Hydrofluorocarbon international commitments: It will be up to Trump's administration to determine what to do with international efforts to curtail the use of highly warming chemicals used in air conditioning and refrigeration. Sen. Jim Inhofe (R-Okla.), a climate change skeptic, has criticized the Montreal Protocol as an overreach. But some industry groups are encouraging Trump to send the treaty to the Senate for ratification (Greenwire, Jan. 12). Oil and natural gas standards: Last year, EPA released regulations under the Clean Air Act that directly limit emissions of methane, a potent greenhouse gas. The rules cover new and heavily modified equipment and operations in the oil and gas industry. Republicans have said they plan to use the Congressional Review Act to roll back the rules, but new analysis from the Congressional Research Service revealed the regulations may not be eligible (Greenwire, Dec. 21, 2016). Financing for overseas coal projects: In 2013, the Obama administration laid out strict new criteria for deciding what foreign coal projects the World Bank and other institutions could finance. The guidelines set in motion the Climate Action Plan and were an effort to use the United States' muscle with development banks to encourage greener energy investments. The coal industry strongly opposed the regulation (Climatewire, Oct. 30, 2013). Arctic and Atlantic drilling: The Obama administration denied all applications to conduct seismic surveys in the Atlantic Ocean this month, two weeks after the president banned drilling in parts of the Atlantic and most of the Arctic. The Interior Department also had previously removed Atlantic waters from its five-year oil and gas drilling plan. While some Republicans voiced support for the move, many would like to see it repealed (Greenwire, Jan. 6). Coal: The Interior Department's Stream Protection Rule, which would implement new water quality restrictions on coal mining, was released last month. Republicans immediately said they would work to see its demise through the CRA. And 13 states have already sued. The rule went into effect yesterday (Greenwire, Jan. 18). Pro-mining lawmakers are also taking aim at an ongoing review and moratorium on coal leasing. The Keystone XL pipeline: Obama rejected the proposed Keystone XL crude oil pipeline, which would have run 1,200 miles from Canada through Nebraska to the Gulf Coast. Trump has spoken out in favor of the pipeline (Greenwire, Dec. 22, 2016). The Dakota Access pipeline: In a win for environmentalists and activists, Obama ordered a full environmental impact statement for the controversial pipeline. This month, the U.S. District Court for the District of Columbia approved the environmental review, but many Republicans would like to see the pipeline advance (Energywire, Jan. 19). Vehicle standards: EPA set tighter fuel economy standards for cars and light trucks for 2022-2024. Some automakers are already asking Trump to soften the federal rules. Trump's pick to lead EPA, Oklahoma Attorney General Scott Pruitt (R), would not commit during his confirmation hearing to allow states to set their own standards. Pruitt said he would review California's current waiver under the Clean Air Act to set its own vehicle pollution rules (Climatewire, Jan. 19). Clean energy tax incentives: In 2015, Congress extended credits for wind and solar in a deal to end the oil import ban, but the final legislation did not cover other clean energy technologies. While many industries have pushed for the tax break to be extended to other forms of clean energy, many Republicans have called for an end to the tax breaks altogether (E&E Daily, Dec. 2, 2016). Energy efficiency standards: The Obama administration pledged to finalize standards that would cut carbon emissions by 3 billion tons by 2030. As of the new year, it's achieved more than 70 percent of that target through finalized efficiency rules. Rep. Michael Burgess (R-Texas) introduced a bill this month to repeal federal energy efficiency standards. The measure would prohibit state or federal agencies from adopting or implementing "any requirement to comply with a standard for energy conservation or water efficiency with respect to a product" (Greenwire, Jan. 5). Ozone standards: In 2015, EPA strengthened the National Ambient Air Quality Standards (NAAQS) for ground-level ozone to 70 parts per billion. The new standards were a revised version of the 2008 ones. EPA is already proceeding with the first steps toward enforcement of the new standard, but at the same time close to 120 million people still live in areas out of compliance with the 2008 standard of 75 ppb. The House last year approved a measure that would delay the implementation of the new standard well into the next decade, but the bill failed to move in the Senate. Last week, the Senate failed to give a vote to a similar proposal by Sen. Jeff Flake (R-Ariz.) (E&E Daily, Jan. 12). Toxic air pollution standards: Last year, EPA issued air pollution standards for cement and brick kilns. The rule set emission limits for mercury, particulate matter and other pollutants. The Brick Industry Association and other industries have filed a lawsuit. EPA acknowledged last year that the new regulations could put some brickmaking plants "at significant risk of closure," eliciting contempt from both congressional Republicans and the U.S. Chamber of Commerce. The House passed a bill last fall that would put the regulation on hold until all lawsuits over the rule are settled. EPA's response brief was due yesterday, with final briefs scheduled for March 14 (Greenwire, Nov. 15, 2016). Clean Water Rule: Gutting the controversial Waters of the U.S., or WOTUS, rule is the No. 1 priority for many Republicans, and a handful of Democrats are wary of the rule. Dozens of lawsuits and a nationwide stay have already halted EPA and the Army Corps of Engineers' plans to implement the standards on the ground. During his campaign, Trump vowed to repeal the regulation, which seeks to define which water bodies are automatically covered under the Clean Water Act. Now, it's only a matter time before it dies, say observers (Greenwire, Nov. 16, 2016). The Antiquities Act: The 1906 law has authorized Obama to designate a slew of protected monuments, including the world's largest marine protected area. Rep. Ryan Zinke (R-Mont.) strongly suggested during his confirmation hearing to be Interior secretary that the Trump administration would take the unprecedented and legally uncertain step of attempting to undo some national monuments established unilaterally by presidents using their authority under the act (E&E Daily, Jan. 18). The Endangered Species Act: The law has added protections for sage grouse, gray wolves and salmon. But new Senate Environment and Public Works Chairman John Barrasso (R-Wyo.) wants to overhaul the Endangered Species Act, adding to the list of key Republicans eyeing the landmark law for reforms. Lawmakers this week floated a bill to end gray wolf protections. Other key Republicans have also made clear that the ESA is in their sights, including House Natural Resources Chairman Rob Bishop (R-Utah), who last year suggested the law should be repealed entirely (Greenwire, Jan. 17). Public lands: Obama expanded the areas designated as protected public lands, but congressional Republicans continue to work to turn over federal lands to their respective states. But the Outdoor Industry Association this week issued an open letter to the incoming Trump administration and members of Congress urging opposition to any proposals aimed at disposing of federal lands, either in private sales or to individual states (E&E News PM, Jan. 18). The Marine Mammal Protection Act: The law has been used to prevent offshore oil and gas development and to protect marine life from Navy sonar. The law was a point of contention in the early 2000s, with the Navy seeking allowances and environmental advocates urging stronger protections. In 2003, the Navy sought revisions to the act in response to a long-running battle with environmentalists who wanted to stop the deployment of sonar systems they said disturbed marine life. Chlorpyrifos: The federal government faces two benchmarks in the dispute over the pesticide chlorpyrifos, which EPA has considered banning because of potential threats to drinking water. A public comment period on the proposed ban ended this week, and a federal court has told EPA to reach a final decision by March 31. Environmental groups sued the agency in 2007 to force a ban. Groups urging the ban now worry a Pruitt-led EPA won't pursue it once Trump takes office (Greenwire, Jan. 17). Carcinogens: In 2015, the World Health Organization's International Agency for Research on Cancer (IARC) declared glyphosate — a key ingredient in Roundup, marketed by Monsanto Co. — a probable carcinogen, stirring controversy over the agency's research methods among industry. Then, last fall, reports surfaced that WHO petitioned its scientists to withhold documents on the glyphosate study. EPA has since approved the use of the chemical, infuriating green groups, who are likely to go to court over the matter (Greenwire, Nov. 2, 2016). "Safer Choice": EPA developed a program in which companies voluntarily submit their products to the agency, which confirms that chemicals of concern are not present. Then, the companies receive permission to use an EPA-approved label to tout the products' benefits to consumers. The program has had an impact not only at niche operations but at major corporations like Wal-Mart Stores Inc. But many manufacturers of chemicals and groups have pushed back against the program, including the American Chemistry Council (E&E News PM, April 28, 2016). The "Furthering Asbestos Claims Transparency Act," or "FACT Act," focuses on plaintiffs injured by asbestos exposure. Currently, lawyers are allowed to tell separate stories about client's exposure history in the civil courts and when speaking to companies that have set up bankruptcy trusts to pay out claims. The practice was detailed in the Garlock Sealing Technologies bankruptcy proceedings, in which Garlock eventually filed racketeering lawsuits against the firms that represented them. But opponents argue the bill burdens claims' trust accounts set up to handle asbestos claims, slowing or stopping their ability to compensate victims. The measure passed the House last year. The "Fairness in Class Action Litigation Act," which passed the House last year, would reform the federal class-action lawsuit framework by requiring affected parties to file separate class-action suits based on the extent of harm inflicted. The reasoning is that people who share injuries of the same type and extent should be grouped together, as opposed to one suit for everyone affected, no matter the extent. The measure could have a significant impact on environmental class-action lawsuits. The "Lawsuit Abuse Reduction Act," which passed the House last year, would require monetary sanctions on attorneys who file "baseless" lawsuits in federal courts. Under the current system, it is up to the judge's discretion whether or not to impose sanctions. The bill would also make it impossible for parties and their attorneys to avoid sanctions by withdrawing frivolous claims within 21 days. Mandatory sanctioning was in place from 1983 to 1992 but was repealed after it was shown to increase, rather than decrease, nonmeritorious lawsuits. The American Bar Association opposed the bill. Goldston of NRDC said the Trump administration has indicated it intends to follow through with many of these measures. "And Congress wants to do even more and weaken the bedrock underlying statues. House Republicans want to shut down the entire regulatory system," he said. "These issues are going to be much higher profile than they've been." He added: "It's an agenda that's promoted by a mix of industrial and ideological interests but will benefit nobody." Nevertheless, Jim Barnette, a partner and energy lawyer with Steptoe & Johnson LLP, said Congress likely won't have time to address every single measure, especially the regulatory reform proposals. "All those face such an uphill battle in the Senate," he said. "It's hard for me to believe that the Senate will have time for long, drawn-out battles on ideological regulatory reform issues, particularly when the Trump administration can accomplish some of those reforms all by itself." He said the future for many of these environmental regulations is truly unknown. "Anyone who tells you how all the various environmental matters are going to play out has a much better crystal ball than I do," he said. But Trump has left little doubt that he plans to scale back as many regulations as possible. "We're going to cut your taxes. We're going to get rid of the regulations that are strangling the economy," he said at a GOP fundraiser in Washington on Wednesday night, according to the new web publication Axios. "I know the biggest businessmen and the small ones that love me and voted for me, and I love them. ... Almost every single person that I ask was more excited about the regulations being cut than the taxes, which is surprising. So, we're going to do that."